This will be less of a full review and more of a first reaction to the issue. I’m sure some people won’t believe this, but I actually felt more lost reading the first half of this book than I did reading Final Crisis itself. It’s been months since the last issue came out, and I’ve never been very familiar with the three incarnations of the Legion of Super-Heroes. The only time I read them on a monthly basis was the “Five Years Later” period that started around 1989 or so — and it’s not represented in this story! I have read the occasional issue of other series, particularly the “Reboot” Legion with its connections to Impulse. After a while I just went with it. That settled out later in the issue, especially as it began to focus on XS and the various lightning-powered Legionnaires as they learned about the legacy of Barry Allen’s brief sojourn in the 30th Century. Geoff Johns attempted to clear up some of the questions of whether Bart Allen was from an alternate universe, and while I think the answer ended up being more complicated than was necessary (since they had already established that sometimes time travelers will end up in an alternate universe), I suspect it’s in the service of setting up threads that will tie into either Flash: Rebirth or the inevitable Flash ongoing that spins out of it. And speaking as a Flash fan, the conclusion of this issue was fantastic. *ahem* now that I’ve got that out of my system. It was great that Jenni was so critical to the process of bringing him back. Despite being separated by a thousand years for most of their lives, the cousins bonded solidly when she was stranded in the past (see Flash: Dead Heat), so it was very appropriate for her to be integral to bringing him back. And I think Geoff Johns has finally found Bart’s voice. In just a few lines, he sounded more like the Bart Allen that Mark Waid wrote than he has in any of Johns’ Flash or Teen Titans issues. Plus there’s hope that even if the Reboot Legion gets shoved to the side again, XS could, in theory, stick around in whatever Legion survives this miniseries. This entry was posted in Reviews and tagged Bart Allen, Geoff Johns, George Perez, Legion of 3 Worlds, XS on February 4, 2009 by Kelson. i had a tear in my eye. His hair and eye color are wrong again though. That always bothers me that they never seem to get it right just because they want him to have red hair. And for an issue this delayed, you would think it would be entirely flawless. Also, not entirely sure why it was necessary to de-age him instead of just letting him be the Flash of the 31st century, but it was still cool. I haven’t yet read the issue, but I think that de-aging him was the right choice. Bart was always best as Impulse, and the artificial aging didn’t really work for him. Man, I can’t wait to get my hands on that issue. I might even head down to my comic shop and grab a copy ahead of my monthly shipment of comics. 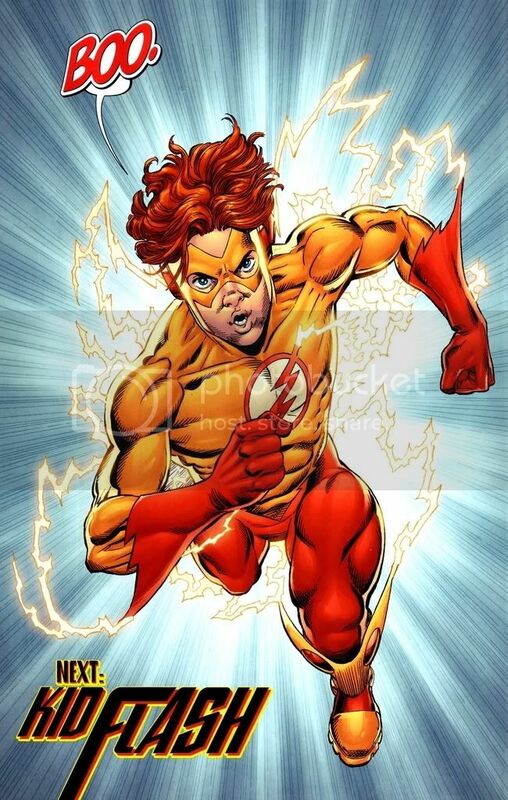 I usually detest Retcons but De-Aging Bart Allen was awesome! I liked him as Impulse and as Kid Flash. Sorry fellas, I actually DID like him in Teen Titans. I dropped Teen Titans after he was taken off the roster. Did we ever find out why he aged those years anyway? (I think we did, I’m just not remembering.) Maybe this is him during those years; after a few more he’ll be forced back in time to live through the destined end of his life. The red hair also threw me. I enjoyed the ish despite my lack of familiarity with the different character versions (and despite how long it’s been since the previous ish). Like Kelson says, once I let it go, it was cool. I still say it was more clear than FC, though. Wow. I’ve got concerns about them pulling what seems to be an echo of Bart out of the Speed Force, though. .-= West’s latest blog post: Mary, Mary, Mary =-. yes! i loved teenage Bart! The (fourth) Flash? HELL NO. .-= Jason West’s latest blog post: The Final Crisis! =-. @Mo: Now there’s timing — I was just about to post a link to the Speedster Site thread where you posted that same scan! i totally hated him at the 4th flash. he was stiff and just not bart like. when i saw lightning saga i PRAYED it was bart trapped in there and i’m so happy it came true. … could dc be actually doing somehting right. . .?? I love the fact that bart is back! But the mistakes that the DC artest and editors keep making anoy me. Bart has brown hair and yellow eyes. Even though i did’t really like Bart as The Flash for an entier year the artest and editors let Bart keep saying he was wearing his uncle Barry’s costume when in fact it was Wally’s costume the whole time. Maybe they should do some homework before they try drawing a charactor. I think i’m asking for to much though. They keep i have of ton of comics and figures that are supose to be Wally West but have blue eyes instead of green like they are supose to. it seems like this is gonna be a returning trend with speeder comics for the future. they die, sacrifice themselves, or are transfered to an alternate reality/time/space but are returned to print after a while…. i really wish the DC writters would give us something new to read about… this stuff is kinda getting boring. but all in all it’s great to hear that bart is back and running with the best of them. the way they did him in was not the end he deserved. Or just be Barry’s Kid Flash like =] I wanna see that grandfather grandson relationship along with his interaction with the twins and Vic. Tell me what you think of my fortune telling lol! I could definitely see Bart being Barry’s sidekick… would be pretty cool considering how highly Bart holds Barry.